PHOTO CAPTIONS: 1. No, that's not a giant rabbit. 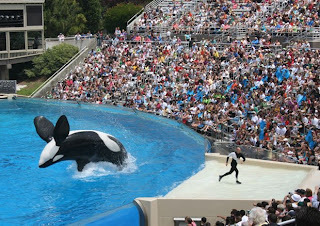 It's Shamu doing a back flip. 2. 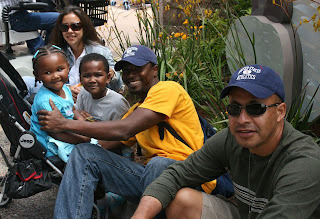 My niece Corrie and her cousin's kids Jayla , age 2, and J'Shon, age 6, joined us for the day, 3-4. 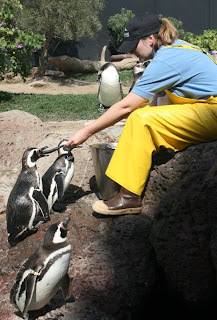 Penguins are a popular attraction at Sea World. June 17 would have been my daughter Maya's 11th birthday. We decided to celebrate in her memory at one of her favorite places: Sea World. We invited my niece Corrie Charfauros who brought her cousin Tiese's kids along for the fun. We ran around to catch all the shows: Shamu, Dolphins, Seal & Otter, Cirque de la Mar, and Pets Rule! Between shows, we checked out the flamingos, penguins and sharks. I was afraid the kids might get bored or cranky since they have season passes and have been several times already. But they held up really well. 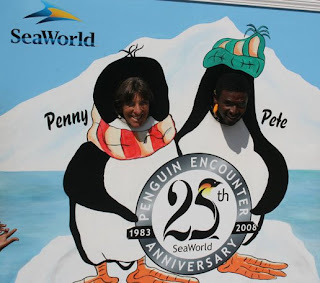 For Andre's birthday on April 23rd I took him to Ocean World in Puerto Plata, Dominican Republic. It's a nice tourist attraction, but can't compare to Sea World. They do have a nice bird exhibit where you can pose for pictures with toucans and other birds perched on you. And the shark show is something I hadn't seen before, although the sharks don't know any tricks. But otherwise, Sea World wins hands down.